Trailer Wheels at Pete’s Tire Barns. 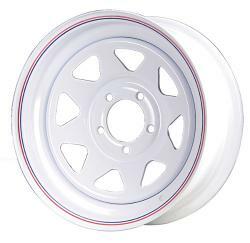 We stock a large selection of trailer wheels to fit most any trailer model or style. With wheels available in both white and galvanized finishes and multiple styles, Pete’s Tire Barns is sure to have the right wheel for your trailer. We also stock a full selection of mounted trailer tires and wheel assemblies. This allows your to purchase a complete assembly and simply bolt it on your trailer. We have trailer wheels for cargo trailers, boat trailers, horse trailers and even construction equipment trailers. Available in a variety of bolt patterns to fit a variety of trailers. Many of wheels for trailers are available in our online tire store. Browse wheels online or visit one of our nineteen convenient Pete’s Tire Barns locations today.